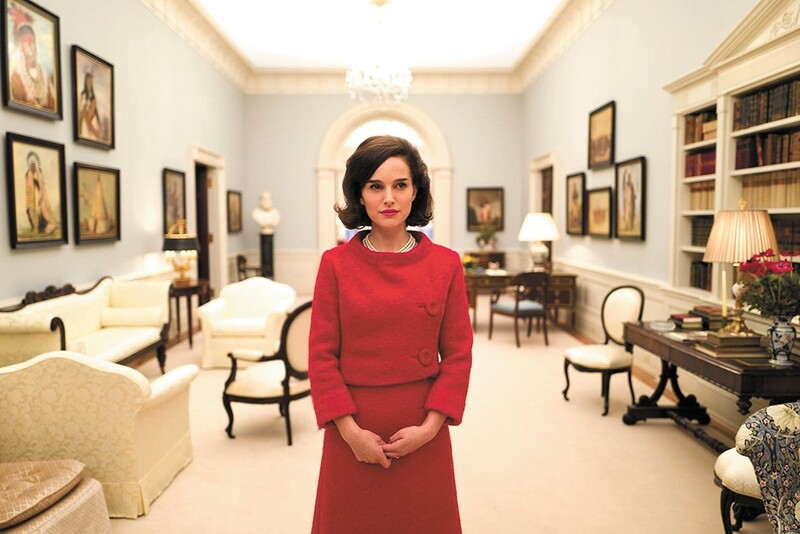 Natalie Portman plays one of our most beloved First Ladies in Jackie. Before a single image appears on screen in Jackie, there is a deeply unsettling swell of strings from Mica Levi's score; something that begins triumphant, then dips into a kind of horror-movie dissonance. Soon, the haunted face of Jackie Kennedy (Natalie Portman) appears — eyes red-rimmed as she walks on the Kennedy family property in Hyannis Port, Massachusetts, just a week after the assassination of her husband, President John F. Kennedy — the music continuing its eerie swing between glorious and terrifying. It's difficult to imagine a film announcing more spectacularly and efficiently what it's about, before a single word is ever spoken: a disconnect between surface spectacle, and something much darker just beneath that surface. Chilean director Pablo Larraín (No) makes his English-language debut with one of America's defining national narratives, and it's initially intriguing to see screenwriter Noah Oppenheim attack it from a new point of view. Jackie often nails the connection between history and image, but it's also never about to let you forget that central idea. As gripping as the story manages to be at individual moments, it's held back from greatness by its repeated underlining of its own thesis statements. Larraín and Oppenheim keep the story moving through the events of November 1963, darting back and forth in time. A framing narrative finds an unnamed journalist (Billy Crudup) interviewing Jackie as she attempts to tell her own side of the tragic tale. The film weaves back to the day of the assassination itself, and the immediate aftermath, including Jackie's visit with a priest (John Hurt). And as the widowed First Lady still grieves, she also tries to plan a service and final resting place for President Kennedy that will anchor his place in history. Much of the tight, 96-minute running time surrounds Jackie's detailed involvement in orchestrating the president's funeral procession, often arguing with Bobby Kennedy (Peter Sarsgaard) or members of Lyndon Johnson's team. That material makes for some fascinating procedural drama, as logistics collide with what today would be called "optics," yet it also finds Jackie repeating more or less the same concept over and over again: It's all about giving Kennedy an epic send-off, something that his achievements might not have earned, but which would make sure he wasn't a forgotten victim of assassination like James Garfield or William McKinley. Jackie is not showing in any theaters in the area.